Does the daily burden of your veterinary business give you no time for yourself? Are you seeking an all-in-one solution for all your veterinary business needs? If yes, it is time you start contemplating a veterinary software switch. Most veterinarians are scared at the prospect of doing so and come up with multiple reasons to not take part in the same. For some, a veterinary software migration means an entire day spent on doing just the implementation of the software. For others, it comes across as extensively time-consuming. 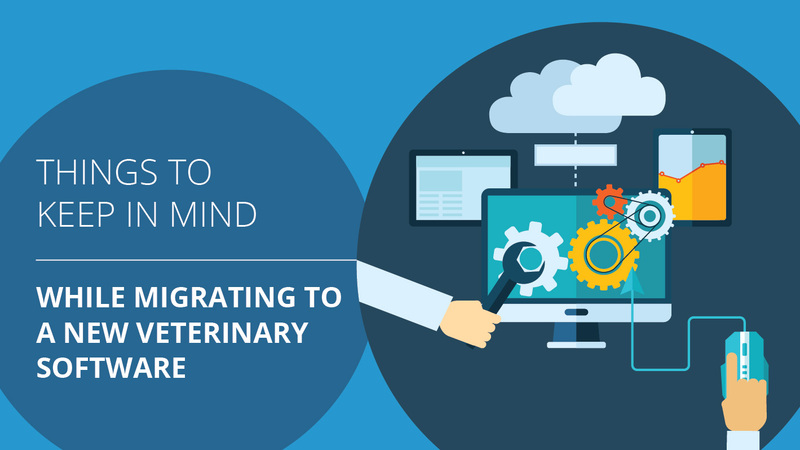 If the hassles associated with the veterinary software migration is something you are scared about, you need to get your basics right about the entire migration process. Here’s is what you need to know. What does the veterinary software migration process look like? Migrating your veterinary software is not a piece of cake. It requires a careful understanding of what you need to take care of while migrating the software. Hiring a skilled veterinary software service provider will make sure that your software implementation is done in the following order. If you’ve decided on getting your veterinary software migration done, make sure that you hire someone for the task who will make you understand the intricacies of the software thoroughly. A good veterinary software service provider will give you the advantage of selecting either full-day training sessions or half-day wherein they get time to take care of their patients too. What’s more? A great service provider will you online training modules as well! When you migrate to a new veterinary software it is essential to take care of the data that already exists with you. Not only this, you need solutions that are better than the ones you already have in store. A good veterinary software service provider will analyze the data existing with you thoroughly and then give you solutions to help in the betterment of your daily veterinary functions. To understand any software in a better matter, it is essential to test the software first and then getting to know whether or not it works for your benefit. Notwithstanding, you will also need someone who will decode your existing data and clean up the bad data for you. Veterinary software migration is simpler when you have someone who does this task effectively for you. During the trial period of new software migration, you will be equipped enough to learn about the things that work in favor of your clinic. 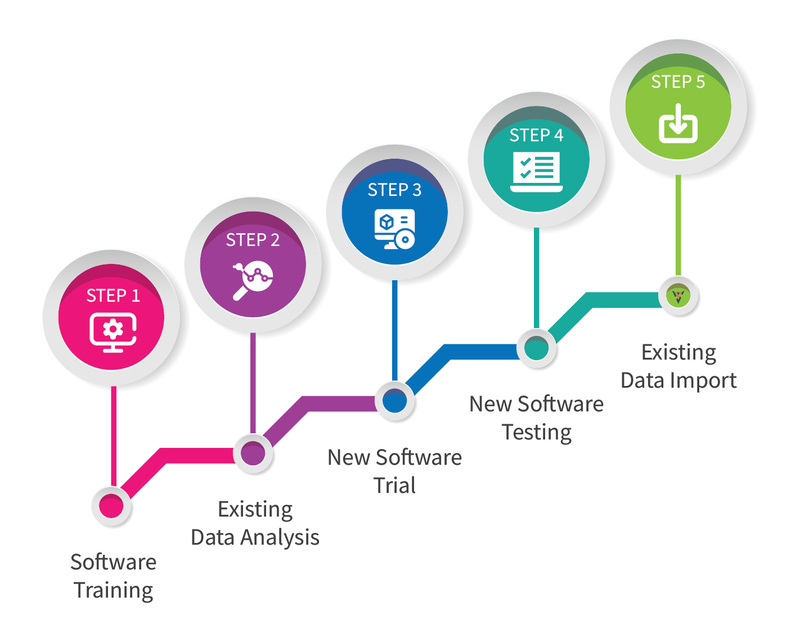 Software testing involves getting rid of the existing errors, validation of data by comparing the old and new and cross verification by the clinic. This step is extremely critical to veterinary software migration processes. Once all is good to go with the new software, you will need someone who will import all your existing data into the new software in an effective manner. Importing a complete set of data will take up to one day for you so make sure you keep that day as the last working day of your clinic. Now that your new software is migrated at your clinic, you may ask the question…. What are the things to look out for in the new software? This is an extremely crucial question you need to ask yourself if you are someone who is considering a veterinary software migration. It involves research on your part about multiple technologies that come in together to create an effective veterinary practice management system. It is often not easy to keep a tab of all the tasks you have on your plate if you rely solely on paperwork. What’s more? It’s simply saddening how easily it gets misplaced! While considering a veterinary software migration, make sure it gives you a cloud. You can store all your data in a cloud and access it anytime you want to. You can even use your mobile devices to do so! While it is imperative for you to migrate to new software, it also needs to be kept in mind that you cannot be wasting too much time in doing so. Why? It’s because your time deserves to be spent on doing what matters - taking care of the patients. A great veterinary software service provider will not take much time in migrating your software. Make sure you talk it out with them first. Often amidst the hustle-bustle of the daily routine of your clinic, you might forget certain essential tasks that you needed to take care of on that particular day. While getting a new software implemented at your veterinary clinic or hospital it is essential to consider the one which gives you reminders about your tasks through emails and notifications. Last but not least, you must see if the software is having all the modules that your practice may need. Different veterinary practices have different needs, e.g. mobile veterinarians will look for the portability aspects, multi-clinic setup practice will need timezone compatibility feature etc. To address this aspect, you should encourage all your staff to try the new software and see if it is meeting their needs. What are the challenges you might face while migrating your veterinary software? Getting your veterinary software migrated requires careful consideration of the following. Before getting your veterinary software migrated, it is essential for you to understand your needs thoroughly. Now, you may ask yourself the question, do you have adequate resources to get the same? If not, it's time you start doing your research about different software available in the market and how they can work for your benefit. If at any time, after your software is implemented you start recognizing problems in the way it functions, you will need someone who gives you thorough assistance on the same. Make sure you hire a software service provider who is equipped enough to tackle all the migration hurdles. Veterinary software migration is not that complex as it might sound to some of you. All you need is someone who guides you at each and every step of the software migration process. Having VetPort as your veterinary service provider will make sure that you are equipped with just the same. At VetPort our veterinary software migration process is simple and does not cause you any kind of trouble.